Compared with residential roofing systems, you have more ventilation options with commercial roofing systems. Unfortunately, the diverse selection might make choosing the right one for your commercial property a bit tricky. In this post, Perfect Exteriors of Minnesota shares the features of commonly used commercial ventilation systems. Many modern buildings utilize a mechanical ventilation system to compensate for the tightness of the building envelope. The systems utilize either a single-point or multi-point fans to remove stale air within the building. The multi-point system is best for larger buildings as the single-point fan only ventilates a small portion of the building. The latter, however, is usually enough for smaller buildings. The only disadvantage of mechanical ventilation is that it can increase your energy costs. As such, it is often paired with non-mechanical ventilation systems like vents. This is another popular commercial ventilation for flat and metal roofing systems and are basically holes in the roof to prevent and regulate air leakage. These are installed in an even line across the roof and can come in different styles to match the architectural style of the roof. Ridge vents exhaust airflow at the ridge of the roof, hence their name. They prevent heat buildup and moisture accumulation, making them one of the most effective ventilation systems available. The fact that you can cover them to blend with the roof is the reason why many roofers, including us, highly recommend them for commercial properties. While the ridge vents exhaust airflow, it’s the eave vents that allow for the intake of fresh air flow into the property. These vents also reduce heat buildup and help ensure good air quality in the building. These work best when used in conjunction with other vent systems, and they are ideally installed at the highest point in the roof. The fact that they are installed under the roof means they can cause hot spots. This is the reason why they should be installed with other vent system, such as static and ridge vents. 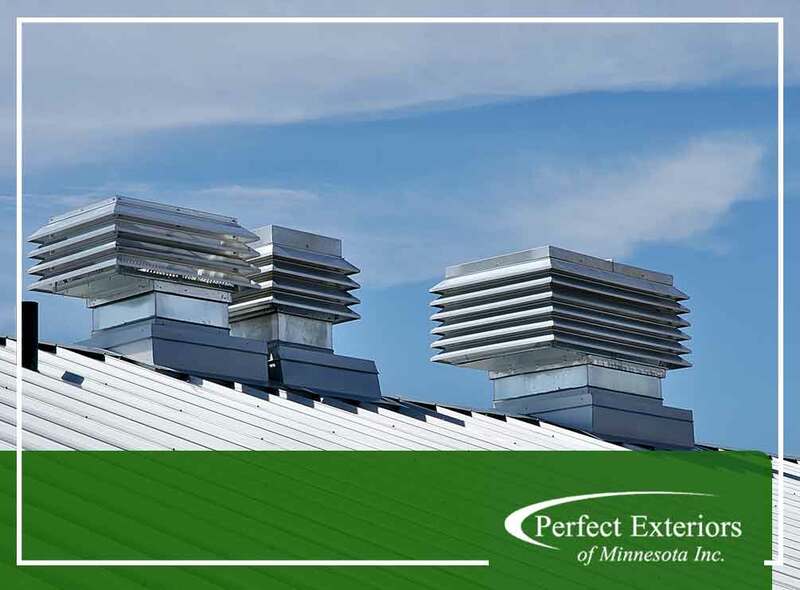 Whether you have a flat or metal roofing system, Perfect Exteriors of Minnesota will help you pick the right ventilation system for your property. Call us today at (763) 307-3001 to learn more. We are commercial roofers in Elk River, MN. LP® Smartside®: The Smart Alternative to WoodDo I Need a Roof Repair or a Full Replacement?